I’m back today with a spring project that brings the outdoors in! It’s an easy spring planter that you could use as a centerpiece for your Easter table or anywhere you want to make a bold spring statement! 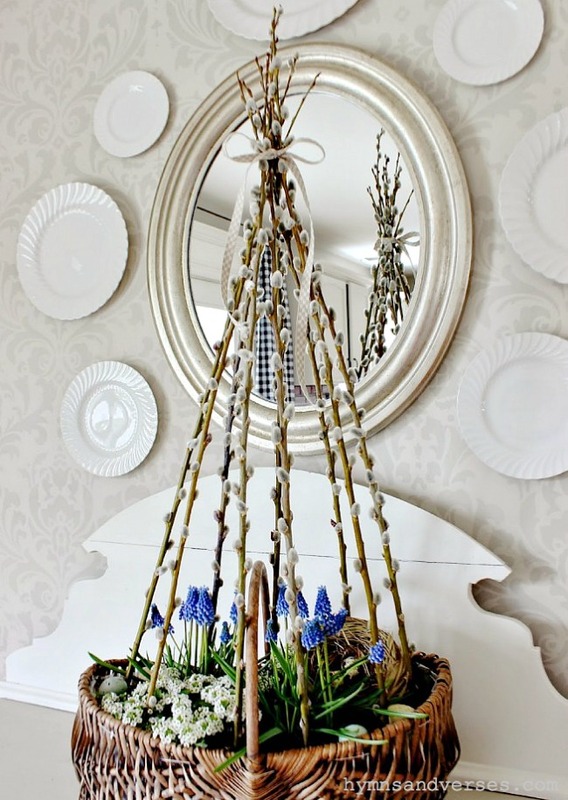 I got the idea for this willow branch cage planter many years ago in a Martha Stewart Magazine. Isn’t this such a unique idea! The inspiration photo above shows that the base of this willow branch cage planter was wheat grass and Easter eggs. 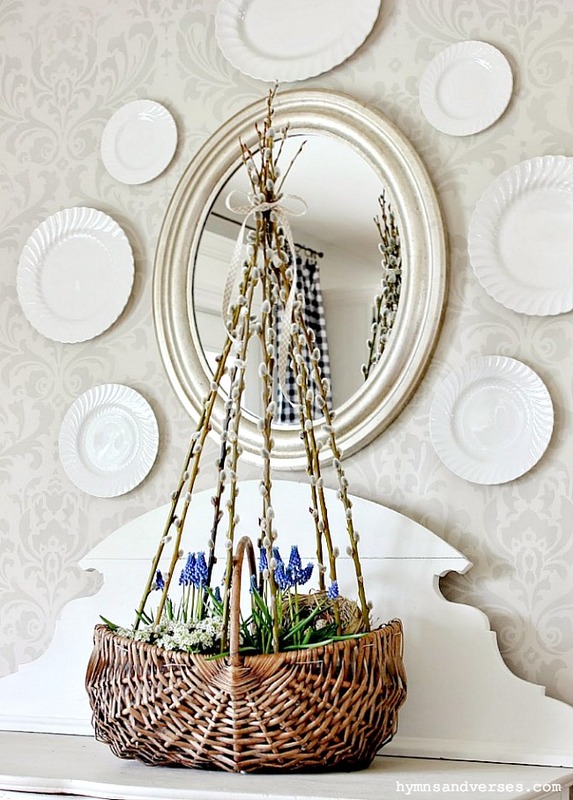 I didn’t take the time to grow the wheat grass and I adapted the idea with the use of a wicker basket instead of a planter like the one pictured in the inspiration photo. This basket is made to be a planter since it is lined with plastic. If you don’t have a basket that is lined, you can always line one yourself using the plastic from a heavy duty trash bag cut to size. I found these bright blue grape hyacinths that had just started to bloom at a local greenhouse. I added some sweet white alyssum to the planter as well. The remaining potting soil was covered with some fresh moss. Next, I added a faux bird’s nest and a few tiny eggs to the planter. Now, for the part that I love – the willow branches. I picked up a bunch of these branches from a local grocery store and cut them all to the size that I wanted (keep in mind how deep you are placing the branches into the dirt when you make your cuts). Whatever container you choose, I think the deeper, the better – the deeper soil gives the branches more stability. Once your branches are cut – stick them into the dirt around the perimeter of your planter. 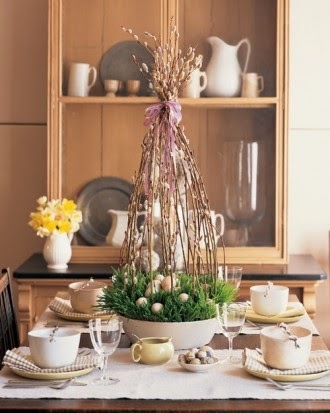 Now, find a pretty ribbon and tie it around the top of the branches. What do you think? 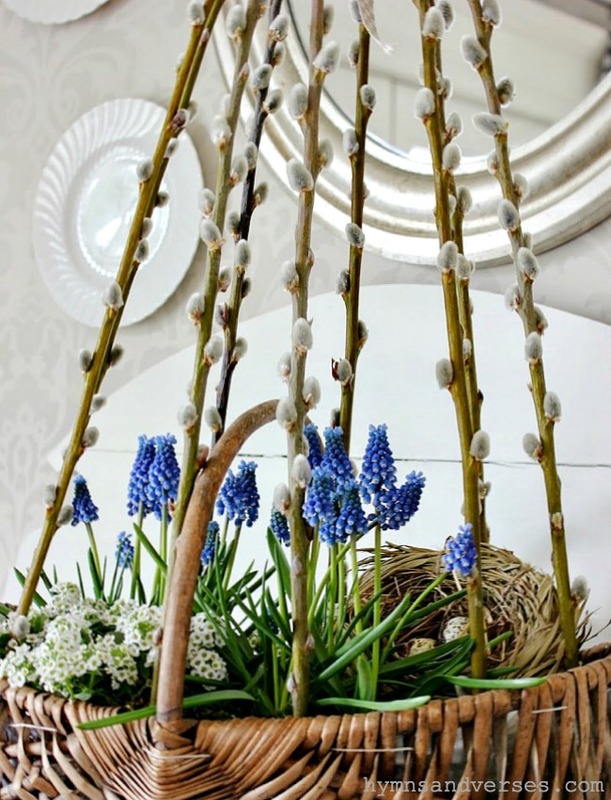 One thing that I do want to point out – the branches used in the inspiration photo are a much thinner variety of willow branch, so more branches were used and those branches did bend more. The willow branches I found were thicker and didn’t bend like those in the inspiration photo. Regardless, I’m happy with how this project turned out! If you like this project, here are a few more you should check out!